UK, 1978, 91 minutes, Colour. Richard Burton, Billy Connolly, Dominic Guard, Andrew Keir. 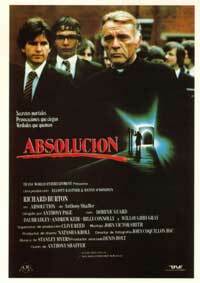 Absolution is a combination of character study and murder mystery. The screenplay was written by Anthony Shaffer (Sleuth, The Wicker Man, adaptation of Evil Under the Sun). In fact, it uses some of the Sleuth techniques for the murder mystery and audiences probably need to see the film twice to see whether the screenplay cheats or not. However, the film is a vehicle for Richard Burton. He portrays Father Goddard, a strict, joyless priest, a master in a boys' boarding school. He becomes a victim of the seal of confession. Dominic Card is very good as the self-centred boy. Dai Bradley is excellent as the boy with polio, on whom the film depends. Any film with Richard Burton and Billy Connolly must he considered an oddity. Billy Connolly appears as a vagrant who wants a job, befriends one of the boys, is murdered. Direction is by Anthony Page (many films and telemovies including I Never Promised You a Rose Garden, The Patricia Neal Story). This film may not make as much impact as expected on the wide audience. It seems to presuppose a Catholic understanding and sensibility. 1. Character study, church and religion, murder mystery? 2. The atmosphere of the school: dormitories, studies, halls, the environs? The school activities? Authentic atmosphere? The variety and mood of the score? 3. The title and audience knowledge of confession, confessing sins, the priest's role, the penance, the absolution and forgiveness? The seal of confession and its absolute nature? Confession and the seal used for practical jokes and mockery and destruction of the priest? 4. How satisfying a murder mystery, the skills of Anthony Shaffer? Straightforward, twists and did the author cheat? 5. Richard Burton as Father Goddard: committed priest, educator, disciplinarian? Smiling only once? The initial encounter with Blakey and rejecting him? Walking the corridors, relationship with the boys, the staff? The Gilbert and Sullivan play, antipathy towards Dyson? The class sequences, the teaching of Latin, rigidly adhering to translation? Teaching of religion, expecting answers from the boys? His relationship with the class? Form master? His criticisms of Dyson, the Gilbert and Sullivan, the questions in class? His treatment of Stanfield, the special coaching with Gerard Manley Hopkins' poetry, serving at the altar, special, reading in class? 6. Blakey and Billy Connolly's style, the bike, seeking work, reaction to Father Goddard, camping in the forest, robbing the kitchen, stopping the runners, befriending Stanfield, his theories of freedom, travel? The girlfriends? The decision to mock Goddard, joking about the absolution? His reaction to Stanfield's action and rejection? His being killed and buried? 7. Stanfield in himself, priggish, arrogant, good at sport, spurning Dyson (wanting to wipe him from his feet? The personal tuition, serving on the altar? His loss of faith? Friendship with Blakey, a vision, freedom? The plan of the mock confession? Blakey's rejection? Pressurising Father Goddard, the confession, the further confession? The threat to Dyson? The burial? The practical jokes on Father Goddard? Dyson missing, following Father Coddard, the brutality of his guests? 8. Dyson and his leg, singing Gilbert and Sullivan, in class, the questions, studies, always present, Father Goddard's attention? The constant rejection and ridicule by Father Goddard? His popularity with the other boys? especially in English class? Stanfield and the tennis, being spurned by him? In cahoots about the confession? His disappearance, the final confession to Father Goddard, the brutal revelation of the truth, his malice, his hatred of Father Goddard, offering him the options of bell or madness, complete revenge? make up? The horror of the ending and his becoming a Christ figure as he stood transfixed before the Altar and crucifix? 10. The ordinary school routine, the intensity of Father Goddard's form? Glimpses of ordinary activities, the plays, concerts, English classes? Staff meetings? The headmaster and his concern about Dyson? The alarm going off and the assembly? 11. The focus on priests, celibacy, teaching, commitment, obsessions, the lack of joy in Father Goddard's life, the potential for madness, the effect? 12. How satisfying the murder mystery? The author playing fair with the audience?